We Tackle All of Your Concrete Needs! When you think about a beautiful and well-kept property in the North Dallas/Fort Worth Area, there are probably many images that come to mind. Perhaps carefully maintained and manicured lawns really highlight a home’s beauty, for example, or maybe you think that it is the building itself that says the most about the state of a property. You might a bit surprised to hear it, but there are factors that are vital to a property’s appearance that you might not ever consider. A well-maintained and beautiful property is one that looks cared for and safe. This is part of the reason lovely gardens, lush lawns, and clean, orderly buildings hold so much appeal. 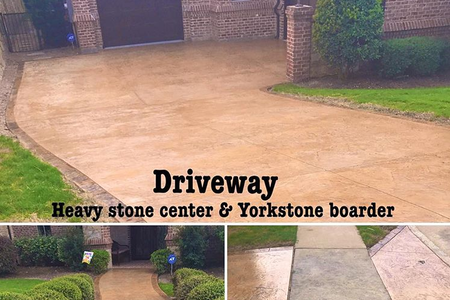 Take those images and insert broken, dirty, and clearly overused concrete driveways in them. Instead of a garden’s beauty being emphasized by sharp, crisp sidewalks and decorative walkways moving throughout it, your attention is suddenly drawn to the ragged cracks and discoloration in the concrete itself. Chances are good that this is not what the homeowners want you to see, of course, but unfortunately the disrepair is just too eye-catching to resist. This is one of the most important things to keep in mind when it comes to concrete. You can pour as many hours as you’d like into cultivating a healthy exterior, including an even lawn complete with bright flowers, but if the concrete you have serving as sidewalks or curbs throughout the space doesn’t look good, the appearance of the property as a whole will suffer. You might not ever immediately think of pristine, stamped concrete as being important to someone’s perception of your home or property, in other words, but it can actually leave a large and lasting impact. What can you do if you’d like your property to appear less like a neglected and run-down location and more like a home that is clearly well-loved? Installing new concrete, from sidewalks to driveways to patio covers, is a great first step to take. And at Prater Concrete, we have the experience and skills needed to ensure that your property is enhanced by your concrete work rather than diminished by it. 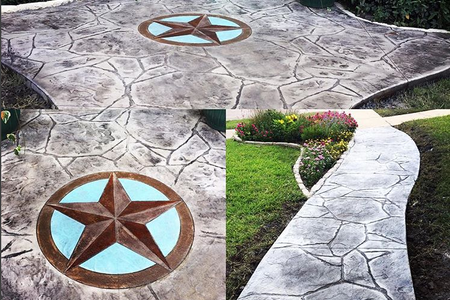 At Prater Concrete, we understand the importance of beautiful and fresh concrete to any location’s appearance. 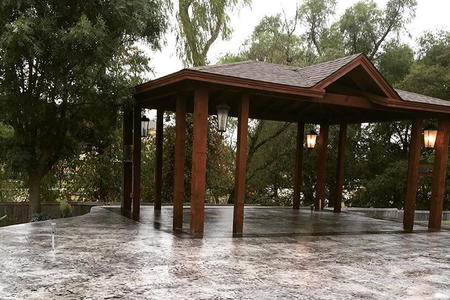 We are familiar with all manner of concrete product, too, and are happy to help install anything from driveways to decorative walkways and even intricate stamped concrete. Whether you have a vision in mind about how you’d like your property to look or need our help to determine what would look good while best suiting your needs, we can help. We have been perfecting our technique for over 20 years and know that we can provide our customers with the best value around. Perfected by time and long hours of work, we currently use Volumetric Concrete trucks that batch the concrete fresh for each job site we service. That means that you can rest assured that you are receiving new concrete that can be poured at the perfect temperature and will last for years as a result. 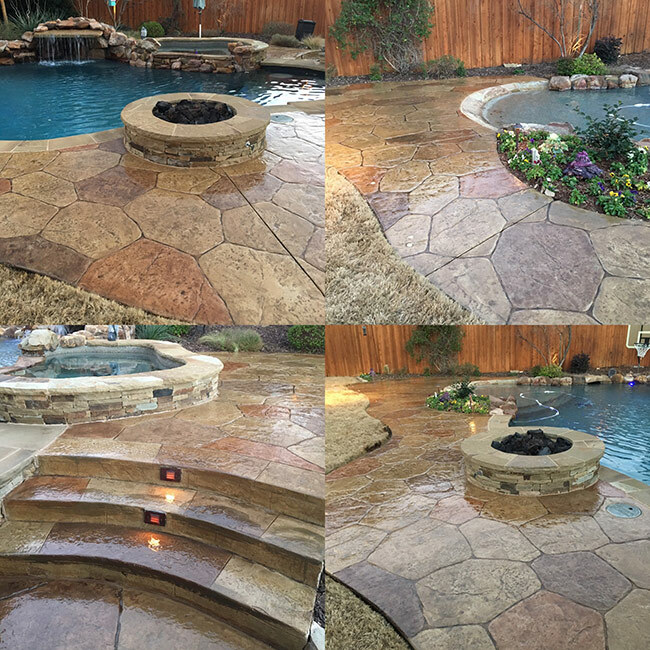 We are proud to boast a 10-year partnership with Deck Masters & Meridian Landscape & Co.
Why should you choose Prater Concrete? If you’re looking for professionals who can help you from concept to creation, look no further than Prater Concrete. 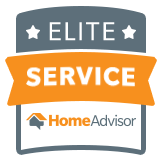 We hold ourselves and our employees to strict standards and offer our customers only the very best in quality service. We are ready to help you achieve all of your concrete goals and offer complimentary on-site estimates to help determine the scope of the work to be done. When you opt for Prater Concrete, you’ve investing in the best concrete service in the area. We’re always happy to speak with potential customers.